The Performance Reports has 3 tabs. Inbound, Number of Answered, Number of Abandoned, Number of Voicemail, Average Handle Time, and Average Speed of Answer. You may customize which metrics should appear as columns. Average Calls/Day, Number of Inbound, Number of Outbound, Number of Answered, Number of Voicemail, Number of Missed calls (with Voicemail), Total Handle Time of inbound calls, and Total Handle Time of outbound calls. 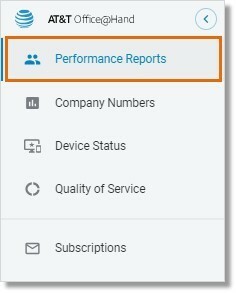 See Analytics Portal – Create Performance Report | AT&T Office@Hand for more information.